"Hey SSR! Start your planning to attend the 51st SSR Annual Meeting at the Hilton New Orleans Riverside, New Orleans, Louisiana. The meeting’s theme, “Pathways to Discovery: Signals for Reproduction, Development, and Longevity,” will have an outstanding series of plenary presentations, including talks on nuclear receptors, mitochondrial function, and longevity and the microbiome, with a focus on the various ways in which physiologic and pathologic signals regulate reproductive processes. State-of-the-Art talks will explore pathways used by stem cells for spermatogenesis and embryonic development. New Orleans is an amazing venue with a festive atmosphere like no other. We promise a truly exciting program for the 51st SSR Annual Meeting. Submit your abstracts now and make plans to attend. With Moira O’Bryan and Bo Rueda as Program Co-Chairs, we developed an outstanding program that includes Presidential Symposium lectures by Anne Brunet, PhD, Michele and Timothy Barakett Endowed Professor, Stanford University; Mary Herbert, PhD, Professor of Reproductive Biology, Newcastle Fertility Centre; David A. Relman, MD, Thomas C. and Joan M. Merigan Professor and Professor of Microbiology and Immunology, Stanford University; and Kenneth S. Korach, PhD, Chief, Reproductive and Developmental Biology Laboratory, NIEHS. Exciting state-of-the-art lectures will be given by Magdalena Zernicka-Goetz, PhD, Professor of Mammalian Development and Stem Cell Biology, University of Cambridge and Shosei Yoshida, PhD, Division of Germ Cell Biology, National Institute for Basic Biology. We will continue to have our trainee workshops and competitions, Heritage and Diversity Lectures, and Exchange Lectures from top scientists from our sister societies: ASRM, SRB, SRF, and SRI. Working with recommendations from Society membership, the Program Committee has chosen focus session speakers to present their cutting-edge research on a wide range of topics in reproductive biology. Concurrent Focus Sessions will allow attendees to choose from a range of provocative topics. Each Focus Session will include 2-3 invited talks, short talks selected from abstract submissions, and flash talks, providing prominent visibility for trainee and early-stage investigator presenters. 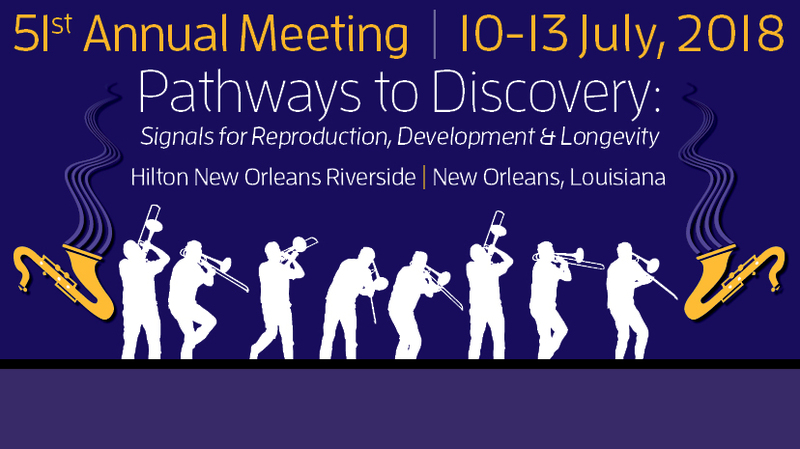 The meeting begins on the 10th of July with the Biology of Reproduction Editor’s Award for best paper, the New Investigator Lecture, the Keynote address and the opening reception. On the 11-13th concurrent focus sessions will follow morning poster sessions. Lots of activities are being planned for our Trainees, including the traditional Trainee-Mentor Luncheon, Trainee Forum (“Treading Thoughtfully through the Career Transitional Path: Navigating Successfully from Grad to Postdoc to Academia or Industry”), Heritage Luncheon, and opportunities for short talks. As an extra bonus an Ovarian Workshop on “Ovarian Aging: Underlying Mechanisms and the Role of Environmental Factors” will precede the SSR 2018 meeting. In this workshop, leading scientists from academia and industry will provide updates on cutting-edge research in the field and offer stimulating discussions to Trainees from a variety of disciplines. We encourage you to join us and your colleagues to share exciting new data and network with colleagues and friends from over 30 countries. Whether it’s the accent, the food, the music or the architecture, New Orleans is one of the most ideal cities in the world for a conference. Make plans to join us in July!"